This entry was posted on 3rd March 2017 by admin. What memorable places hold a special memory or event for you, your family, friends or your loved ones? We have a gorgeous new personalised cushion that can commemorate locations that mean something to you or someone else. 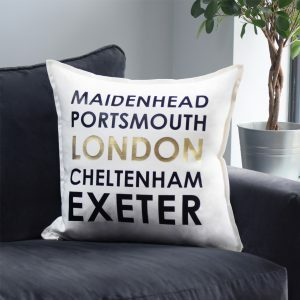 Our striking cushions can be personalised to read towns or cities that you visited on holidays or perhaps places that you have lived in and can be easily added to any living room sofa, chair or bedroom for a fuss free touch of style and originality. You can select from a choice of gold, silver, copper, green, pink or red for the metallic text and have the option of purchasing the cushion cover itself or with the plush duckfeather inner. Our beautiful cushions are made in house in our Pushka Home studio and are ideal for gifting for any occasion. The world is your oyster with this cushion with its array of location and personalisation possibilities. Just click on the photo below if you wish to find out more on this unique item.